I enjoyed Philip’s simple and clear approach to both composing and music making. All of the scores were clearly marked so that time was not spent on phrasing and cutoffs. But most of all I enjoyed watching him work with the group because of his demeanor; he was very confident, sarcastic and witty, but always positive and upbeat. He is a great example of how you can still have fun but expect a lot out of a group. Many of the strategies he suggested were very useful, but simple. My favorite pieces that we read through were “Do Not Be Afraid,” a lush and peaceful setting of a lovely poem, and his setting of Psalm 150, which had effervescent organ writing, and beautifully written choral lines. Thanks for a great day of music-making! On a cold, blustery but sunny Martin Luther King, Jr. holiday, Baltimore AGO members and their friends, totaling about 50 individuals, gathered at the beautiful St. Mary’s Seminary for a wonderful workshop presented by the dynamic and talented Philip Stopford. Philip led a very informative workshop that included wonderful reminders of good rehearsal and conducting techniques as those gathered sang through his anthem compositions. I was very impressed with the accessibility of his anthems and how well-crafted they were in their composition. Visit Philip’s website at http://philipstopford.com to peruse or order his compositions. There was much collegial connection over breakfast catered by Panera Bread and lunch from Carrabas. It was really a great gathering of supportive and appreciative colleagues! 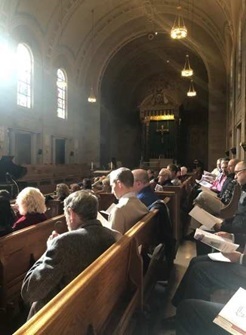 Many thanks to the workshop organizers, Sean O’Connor and Joseph Martenczuk; to our host, Paul Binko and the community at St. Mary’s Seminary; to our accomplished accompanists, Jordan Prescott and Michael Britt, and to our brave conductors, Amy Broadbent, Glenn Osborne and Rob Barbarino! Your service and ministry were greatly appreciated!